The 19”/2 RS232 Switch SSW101 lets you share serial devices, like radios or satellite modems between multiple users. Each port can be configured with its own IP address. And with both fiber optic and copper connectivity to the LAN, you can work both on-site and remotely. The unit saves space with a form that’s up to 75% smaller than standard units. 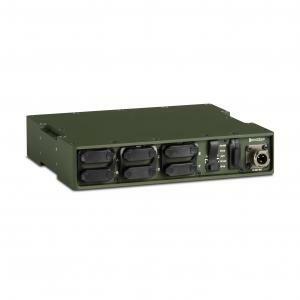 This rugged switch was also designed from the ground up to survive in any environment. That toughness has been proven on the ground in combat operations in Afghanistan.